It is often that we do not pay attention to one of the most important parts of the dressing – shoes. Counted among the underrated elements of your attire, the shoes you wear go a long way in determining your looks and making you appear fashion-forward, stylish and trendy. If you pair your ensemble with the right pair of footwear, you will make a long lasting impression. However, making sure that your shoes add up to your style quotient, you have to be cautious of what you are wearing and how you maintain it. If you will not take care of your shoes and start wearing them without cleaning dust and dirt, you will look like a hobo. So, here are a few tips that would help you to take care of your shoes. Taking care of shoes is equally important if you are not wearing them. In other words, you should store them properly. it might surprise you but most shoes get damaged because they are not stored properly and correctly. So, there are three things that you should keep in mind at the time of storing your shoes – keep them off the floor, use shoe boxes for storing them and do not store them wire racks. Irrespective of the fact whether or not you will believe in weather forecasts, there is no accountability of weather and its unpredictability. If you see dark clouds in the sky then do not even wasting time, spray your shoes with a waterproof protector. This becomes all the more important if you have brand new shoes. While we do try to protect the shoes from any outside damage such as dust and rains, it is quite often we forget about the damage that can happen inside. The perspiration and sweat from the feet can leave nasty and ugly stains inside them – specifically if your shoes are made of canvas. As a matter of fact, if you are using running shoes then you will sweat from feet, for sure. This is why stocking up on sock liners makes for the best option to consider. You might be having the best of the Adidas, Nike or Puma running shoes in your collection, however, if you will not clean and maintain them properly, they will not last long. How you clean the shoes depend solely on one main factor – the type of material used for making them. 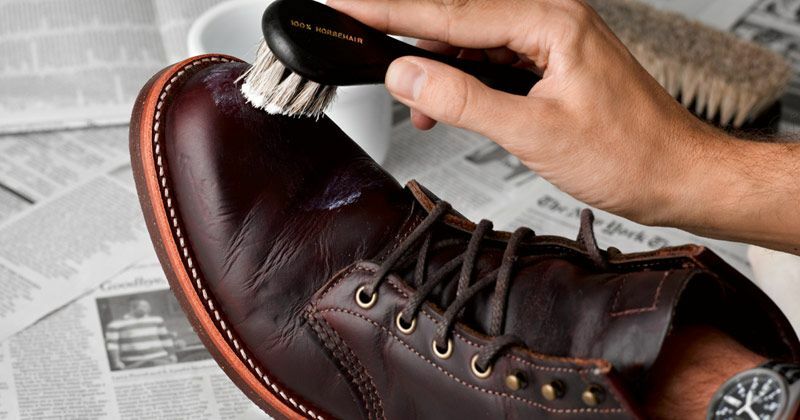 If you have leather shoes then you will require a leather conditioner for cleaning them, suede shoes need protective sprays to be cleaned properly. if you own canvas shoes, clean them with a sponge or wet cloth is the best way. When it comes to white shoes, you have to be extra careful. After all, white gets dirty easily and is more prone to show off marks and stains. So, if you have a collection of white shoes than pay extra attention. Remember if you do not take proper acre then they will be damaged and you might not be able to wear them again. So, follow these tips to take care of your shoes and accentuate your style to the best.